One of the more important decisions for a Christmas tree grower is which species to plant. Each potential species has its own identifiable characteristics and is uniquely suited for certain areas and selling methods. The following is a brief summary of the various trees often grown in North Carolina for Christmas tree production. Fraser fir is a very attractive Christmas tree species. It has glossy, dark-green foliage, strong branches which easily support heavy ornaments, and pleasing aroma. It has excellent needle retention, making it suitable for shipping long distances. Fraser fir needles are flattened, with a medial groove on the upper side and two broad silvery-white bands on the lower surface. These bands consist of several rows of stomata (pores). Needles are 1⁄2 to 1 inches long, have a broad circular base, and are usually dark green on the upper surface and lighter on the lower surface. Needles are retained for 3 to 6 growing seasons. 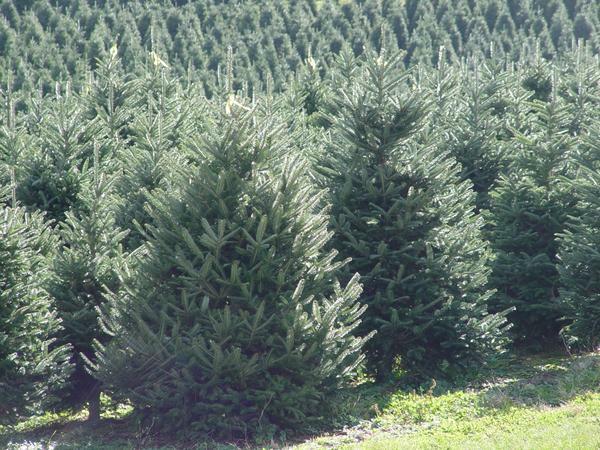 The natural range of Fraser fir is restricted to higher elevations (above 4,500 feet) in western North Carolina, eastern Tennessee, and southwestern Virginia. For best results, it is recommended that Fraser fir not be planted below 3,000 feet elevation in North Carolina. The species is sensitive to drought conditions and to poor soil aeration at any elevation. The most damaging insect pest is the balsam woolly adelgid (formerly called an aphid) which is an imported, wingless insect. Phytophthora root disease attacks Fraser fir, and is most harmful at lower elevations. Clay or otherwise tight soils greatly increase the probability of the trees being killed by Phytophthora. On well-drained sites, five-year-old transplants will require about 5-8 additional years to grow into 7 to 8-foot trees. Fraser fir is grown in the mountains in North Carolina. In North Carolina, white pine is native to both the upper Piedmont and Mountain regions. The species has soft blue-green foliage and relatively strong branches. The species is easily dug for use as a living Christmas tree. White pine needles are soft, flexible and bluish-green to silver-green in color, arranged in bundles of five, and 21⁄2 to 5 inches long. Needles are usually shed at the end of the second or third growing season. Within its natural range, satisfactory growth of white pine is seldom hampered by variation in slope (gradient), aspect, or elevation. However, frost damage may occur on sites with poor air drainage. On lower Piedmont sites, white pine plantings should be restricted to northern slopes containing well-drained, moist soils. White pine has also been grown in the Coastal Plain, but extension of the species beyond its natural range is risky. White pine is susceptible to root disease, although not to the same extent as Fraser fir. White pine is also attacked by white pine weevils and pine bark adelgids. As for most species, sheared trees are preferred, although some people feel heavy shearing results in trees that are too dense for larger ornaments. Needle retention after harvest is good. White pine has very little aroma, but is reported to result in fewer allergic reactions than some of the more aromatic species. Many white pines are artificially colored prior to sale. To produce a 6-foot tree requires 6 to 8 years on good sites. 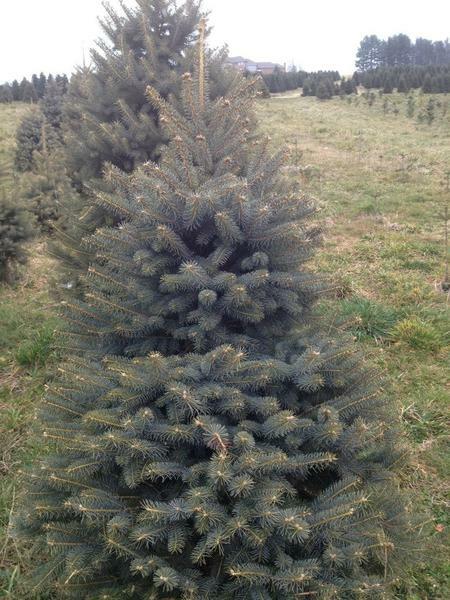 Virginia pine is the most popular species for choose and cut Christmas tree growers in eastern North Carolina. It occurs naturally in North Carolina in the Mountain and Piedmont regions. Virginia pine's needles occur in pairs, are often twisted, and range from 11⁄2 to 3 inches in length. Needles are usually shed after three to four growing seasons. Branches are stout and woody and are excellent for holding ornaments. Virginia pine produces multiple flushes of growth during the growing season, resulting in the need to shear two to three times each year. Virginia pine can be grown on a variety of soils from the Coastal Plain into the lower mountains. Growth is rapid, so rotations of 4 to 6 years are possible. Virginia pine is much less sensitive to soil fertility than Fraser fir or white pine, but fertile well-drained soil is best for vigorous growth and dark green foliage. The species is subject to rust canker, but the main problem is tip moths. In late fall, Virginia pine foliage has a tendency to turn light green to yellow. If poor color is a problem, it can be alleviated by artificial coloring before marketing. Redcedar, for many years, has been the traditional native Christmas tree in eastern North Carolina. Its chief disadvantages are prickly foliage, often poor form and color, and limber branches. The leaves of redcedar are very small (less than 1⁄10 inch long) and scale-like. There is wide variation in color, shape, disease resistance and needle type among individual plants. Some scientists recognize a separate, similar species (Juniperus silicicola) which occurs near the Atlantic and Gulf coasts and has longer and more-spreading leaves. Redcedar grows best on loamy soils of limestone origin, but it can be grown as a Christmas tree on almost any site in North Carolina. A major pest is Phomopsis blight, which is a fungus that attacks the foliage. Redcedar dries out quickly after cutting unless the stem base is kept in water. This species should be marketed locally because it is not suitable for shipping. Most trees are artificially colored before harvesting. This red cedar clone has a full dark green growth habit. Leyland cypress is a cultivated hybrid of Monterey cypress and Alaska cedar. It is grown in all southern states as an ornamental and recently is becoming popular for Christmas trees. Based on trials in the southern United States, the 'Leighton Green' cultivar is the most desirable for Christmas trees. Leyland cypress grows well on a variety of soil types, with best growth on well-drained upland soils. Christmas trees are usually harvested at ages 3 to 6. Major pests include bagworms and several species of canker diseases. Because of its tendency to dry quickly after being cut, Leyland cypress is generally recommended for production only on choose and cut farms. Arizona Cypress has become a minor Christmas tree species for Piedmont and Coastal Plain growers and is popular with the landscape industry as an ornamental and screening tree. Most growers that grow them have a small percentage of their crops in Arizona cypress. They are very heat tolerant and somewhat drought tolerant and grow well in well-drained soils. Carolina Sapphire is a fast-growing cultivar or clone and because of fast growth, requires regular shearing and shaping. It tends to have a bushy form. It as a silvery blue/teal color year-round and produces a distinct citrus-like fragrance when displayed. Branch structure does not readily accommodate interior tree ornaments. Blue Ice is a somewhat slower but still fast-growing cultivar more prone to having a more compact and columnar form than Carolina sapphire. It has a steel-blue color and is very prone to stem canker easily spread by failing to sanitize shearing tools. There are many cultivars of this plant that is often incorrectly spelled as one word – arborvitae. Most Christmas tree growers produce the cultive Green Giant. It is gaining popularity with Piedmont and Coastal Plain growers as a substitute for Leyland cypress because of its presumed resistance to foliar diseases including Passalora needle blight. It has a similar appearance to Leylands but is somewhat more prone to having a strong central stem that can be promoted with shearing and pruning. It grown well on well-drained soils slightly acidic in pH. Several other species are being grown on a limited basis in North Carolina. All of them grow somewhat slowly, requiring from 8 to 15 years in the field to grow to Christmas tree size. In addition to the slow growth, susceptibility to several pests may increase the cost of production. A problem with many spruce species is their tendency to drop needles quickly as they dry. Thus, many growers prefer spruces for dug, live Christmas trees. White spruce (Picea glauca) can be found throughout Alaska and Canada, and in the United States in New England and the Lake States. A taxonomic variety of white spruce (P. glauca var. densata), is found in the Black Hills of South Dakota and is sold commercially as "Black Hills spruce." The variety Albertiana is sold as "western white spruce" or "Alberta white spruce," although some experts believe it may be a form of the variety densata. White spruce needles are usually 1⁄2 to 3⁄4 inches long, blunt at the tip, and green to bluish-green in color. Typically, needles are four-sided (rectangular in section) and are present on short twig-like structures on the stem (sterigmata). As a Christmas tree, white spruce has excellent foliage color and a good natural shape. Needle retention is better than that of some of other spruces. Blue spruce or Colorado blue spruce (Picea pungens) occurs naturally in higher elevations of western Wyoming and eastern Idaho southward through into Arizona and New Mexico. Blue spruce needles are 1 to 11⁄4 inches long on lower branches but somewhat shorter on upper branches. They are four-sided and have a very sharp point on the end. Needles are generally dull bluish-gray to silvery-blue and emit a resinous odor when crushed. The cultivated variety 'Glauca' is noted for its distinct bluish-white or silvery-white foliage. The species has a natural Christmas tree shape and requires little shearing. Additionally, needle retention is among the best for the spruces. 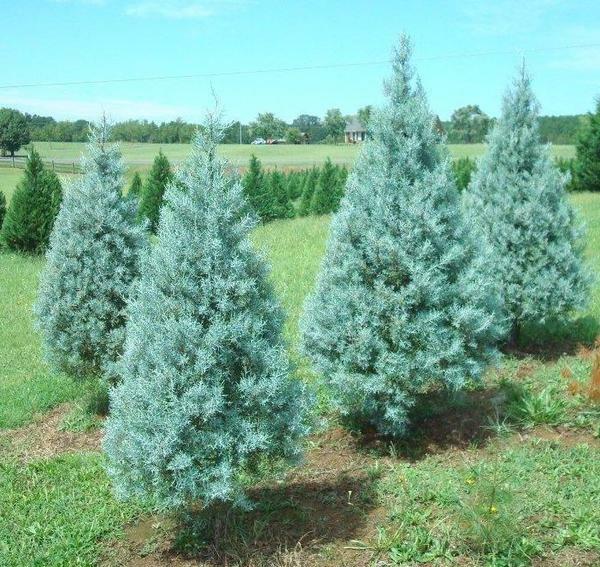 Its popularity as an ornamental leads many consumers to use blue spruce as a living Christmas tree, to be planted after the holiday season. Norway spruce (Picea abies) is not native to the western hemisphere, but it and a number of its varieties are commonly planted in the United States for ornamental and Christmas tree purposes. Norway spruce needles are four-sided, 1⁄2 to 1 inches long, and sharp to somewhat blunt at the tip. Needles are generally dark green. At the base of each needle is a sterigmata which remains after the needle is lost. Norway spruce is adapted to cool temperate climates. Growth is best in full sunlight in deep, rich, moist soils. It is generally shallow-rooted and does not produce a taproot, thus is subject to being blown over by wind. By being shallow-rooted, Norway spruce is easier to dig and more likely to survive when planted after the holidays than are many other species used for living Christmas trees. Overall color of Norway spruce for Christmas trees is fair to excellent. Needle retention is considered poor unless the trees are cut fresh and kept properly watered. White fir (Abies concolor) grows naturally in various parts of the western United States, and is grown with varying degrees of success in the North Carolina mountains. 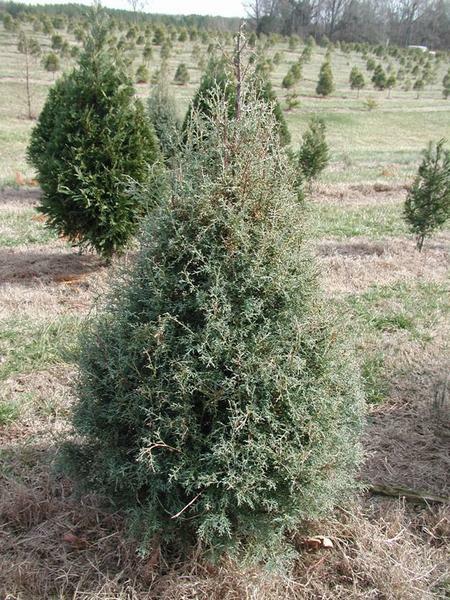 As a Christmas tree, white fir has good foliage color, good needle retention, and a pleasing natural shape and aroma. Needles are 1⁄2 to 11⁄2 inches long, pointed or notched at the tip, and bluish-green when young, turning dull green with age. Site requirements are similar to those of other fir species. However, frost damage to young growth often occurs on areas with poor air drainage. It takes 10 to 15 years to grow white fir to merchantable size. For further information, please contact your local Cooperative Extension center.